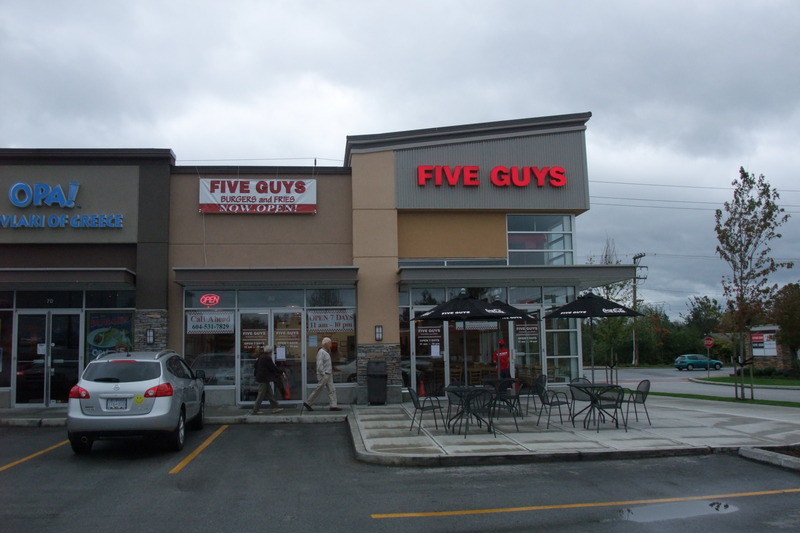 Five Guys Burgers & Fries has 2 locations in Greater Vancouver. One is in West Vancouver at Park Royal Mall and the other is in South Surrey at the sprawling Morgan Crossing development. Famous for the 2 things mentioned in their name there is nothing else on Five Guys menu but burgers, fries and things to wash said items down. I visited the Park Royal location a few months before I started writing about food and I thought it would be a good idea to check out the newer location out in South Surrey. 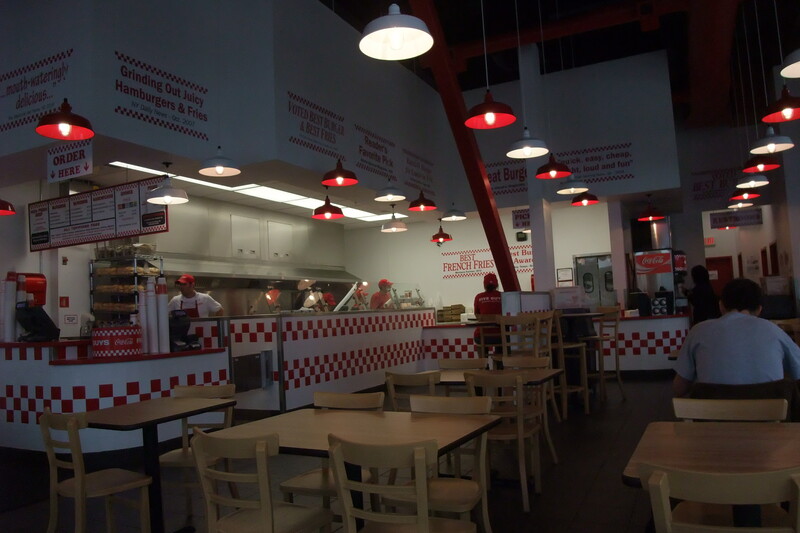 The inside of Five Guys has a very sparse red and white theme the reminds me of an 80’s pizza shop. The South Surrey location is a little larger than Park Royal but retains the feel of a burger and fries only fast food factory, in a good way. There are bags of potatoes stacked on the floor, plain wooden furniture and a very energetic staff ready to make you a fresh meal as soon as you walk in the door. The menu consists of 4 burger options, burger, cheeseburger, bacon burger and bacon cheeseburger. The standard burger has 2 patties but they are all offered in “little” form with 1 patty. There are 16 toppings to choose from which are all included in the price. The fries come in regular and large size and are offered plain or Cajun and are cooked in peanut oil. I ordered the bacon cheeseburger with lettuce, pickles, mayo, mustard, ketchup, hot sauce and jalapeños with regular Cajun fries and a regular drink. There are 2 drink sizes but both are free to refill so I’ll let you do the math. My number was called and I headed up to the counter to retrieve my grub. 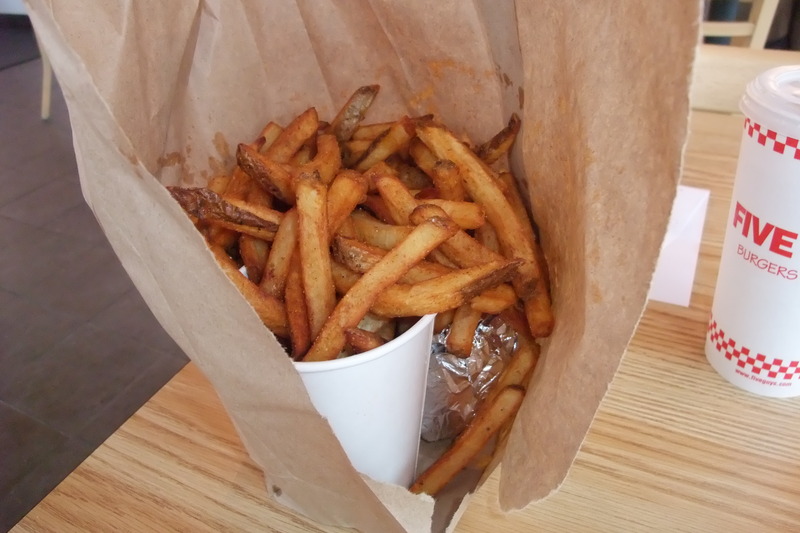 The brown paper bag was filled about 3/4’s full with fries and I had to rip the bag open to find my burger. The fries were very good and the Cajun seasoning was excellent, nice and spicy. My Burger was amazing, juicy, fresh and spicy. The jalapeños are raw and not from a can so they had a little extra kick. There are no freezers in any 5 Guys restaurant because they believe in fresh beef cooked to order and it pays off in their tasty burgers. I have read a few other local reviews of 5 guys and they generally all have 2 identical complaints, price and calories. To put the price into perspective my meal was $15.76 which may seem a little on the pricey side but if you order a single patty and you are there with someone who you can share fries and a drink with the price would come in at around 10 dollars each which isn’t much more than other fast food burger joints that aren’t half as good. The calorie comments are ridiculous as burgers and fries aren’t supposed to be healthy. If you want lower calories eat a salad and if you want a lower price go to the supermarket and make it yourself. Would I recommend 5 Guys Burgers and Fries? Let me put it simply, this burger is the best non sit-down restaurant burger in town. That is a bold statement but I will stand by it. These burgers stand above Vera’s, Fat Burger and all of the big fast food chains. There is also free roasted peanuts in big boxes for you to crack open and snack on while you are waiting for your food. There aren’t too many meals that I haven’t been able to finish in my life but this was one of them, so if you’re going to 5 Guys bring a friend and prepare for an awesome burger and fries!! I’d spend just as much at Red Robin so why the heck wouldn’t I throw down the same money for something this much better? SOLD! I’m going to have to try it SOON! Great burger! I love the original fries too. FINALLY!!! A 5 GUYS is opening soon just a stones throw from mywork! I CANNOT WAIT!! There is a FAT BURGER just acroos the street as well, if I was them I would be scared, 5 GUYS is head and shoulders above FAT BURGER! I went to give a try at the new location that was opening on Fresh Meadows NY this was the best burger i have try and the fries was excelente and the price i pay was worth every pennies good job guys. The only issue I have with Five Guys is that they are out of the US and the franchisee’s they picked are from the US as well. The franchisees don’t even live in Canada. Seriously Five Guys couldn’t have found a Canadian to be the franchisee? Even the franchisees executive team are from the states. It might be good food but out of principle I am staying away!!!! That’s a fair point to make but don’t forget that American companies provide jobs to Canadians. Without the likes of Home Depot and Best Buy I wouldn’t own the house I live in!!! My family and I stopped for the first time in Deptford, NJ. food was great, service great but my two girls wanted a milk shake and there were none. I do realize this is not your target but nothing compliments a great burger more than a milkshake. Hopefully someone is addressing this. Just to clarify, I am an independent food writer and I do not work for Five Guys. 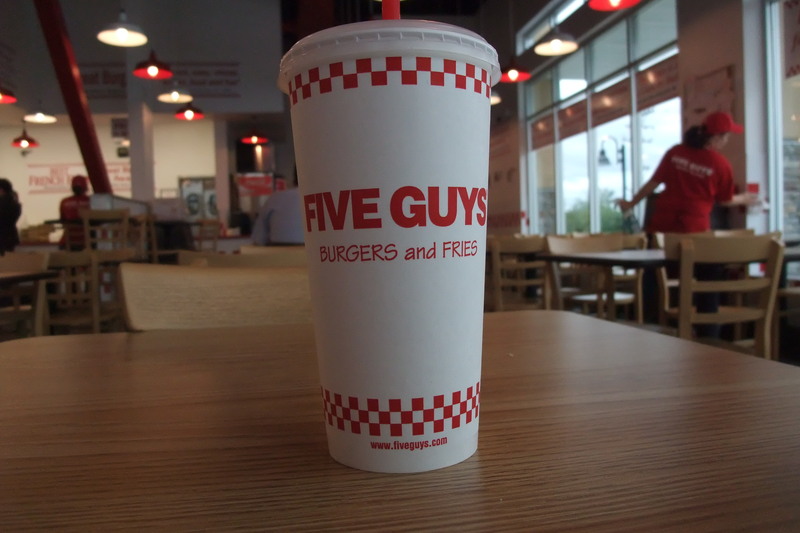 If you would like to contact Five Guys directly you can do so here, http://contact.fiveguys.com/questions.aspx . I think Milkshakes would be great too and the locations near me don’t have hot dogs either!!! Hello there, I like the blog! I have been following your blog for a short time now and i am really taking pleasure in it. I actually had a couple of questions concerning your blog post though. You think it will be achievable for me to contact you further to discuss it? Maybe set up a chat on email or an instant messanging application? Otherwise, thank you anyhow and I’m going to continue to read and comment. Feel free to contact me at whatforlunchbc@rocketmail.com. I look forward to hearing from you! Thanks for the great information! I just found out that a Five Guys is coming to my area in Washington state. We have Red Robin about a block away, but am always up for something new. However, my son is allergic to nuts (peanuts, cashews, etc). Do you know if all locations use peanut oil for the fries & peanuts for ‘appetizers’? Thanks! Hi Mary, I’m pretty sure they use peanut oil at all of their locations as well as having the boxes of peanuts. You may be able to contact 5 Guys via their website to find out for sure. 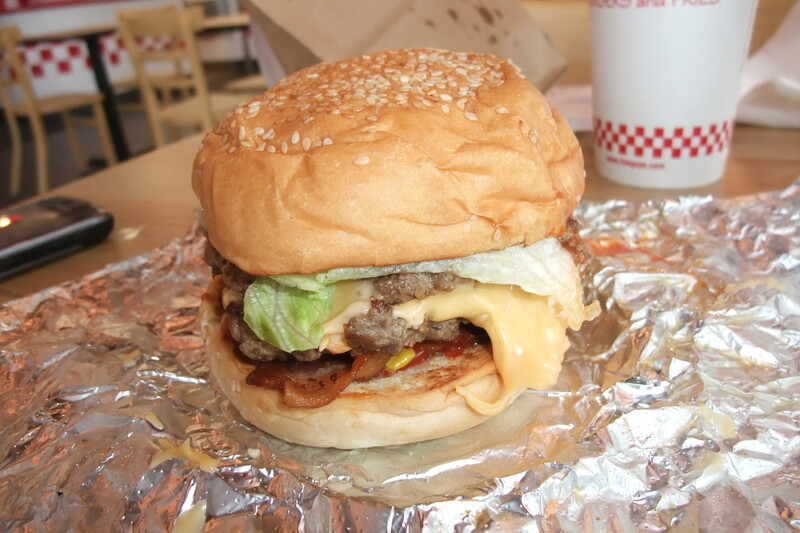 I do love 5guys Burger.I would like them to offer green chilis on that list of things to put on my burger. Scott, to your blog reader Mary on her question about all Five Guys using peanut oil to deep fry their fries and peanuts for apps in all store. Unfortunately or fortunately, they do use peanut oil only and have peanuts in all stores. Me and a friend discovered 5 guys about 2 months ago and have been going at least once a week since. I can see people’s problem with it being pricey, but you get what you pay for right. Sure you can go to Mcdonalds and eat for 5 bucks, but you won’t get nearly as much food, and I won’t even go into the difference in quality! The one thing I noticed about 5 guys is that you don’t feel gross after eating it, possibly due to the freshness of ingredients? Great blog, love the site, keep it up! This is so great. I grew up in NYC and to now be out in central cali its just HARD to find em!!!! Great job! I want to try this place one day. I looooooooooove Vera’s and Fatburger so I really want to try this. Unfortunately I’m in the same boat as Mary… we walked in with our kids to see peanuts everywhere and slowly backed out as if the peanuts would attack us, LOL. My 6 year old has anaphylactic peanut allergy 😦 But I do hope to go in one day on my own or with the Mr.! !